Here is something else to help you with those New Year’s resolutions. 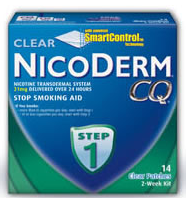 Start to kick the habit with a Free non-medicated sample of NicoDerm CQ. Along with the sample will be a $7.00 coupon for NicoDerm CQ with Smart Control. So come on, there is no excuse now. You can do it!! And if you don’t need it, sign up someone who can use it. Maybe when they get it in the mail it will motivate them to give it a try.